This week’s been full of useful tips for anybody trying to break into the lucrative Chinese film market. Ghosts are bad news, for instance, but (non-supernatural) magic is good. 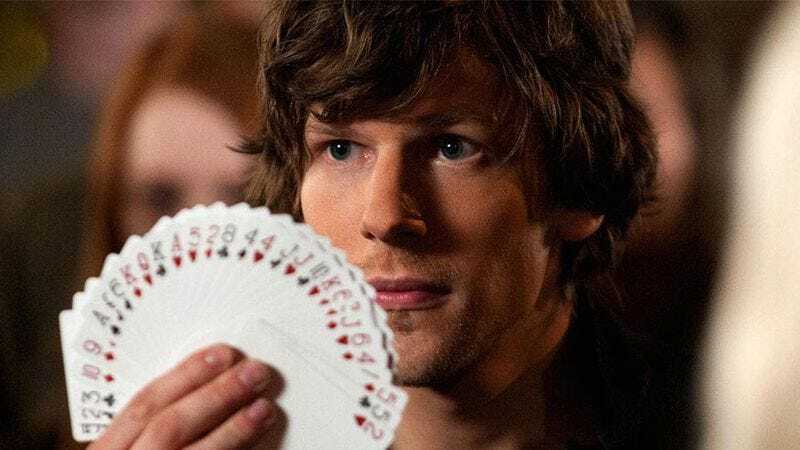 Very good, according to The Hollywood Reporter, which brings news that the card trick-based shenanigans of the Now You See Me franchise are getting a Chinese-led spinoff to capitalize on their overseas success. The new film—produced by Chinese studio Leomus Pictures—will be shot in China and feature a mostly Chinese cast, while still trying to capture that “Woody Harrelson pulls a rabbit out of his fedora” vibe of the American originals. The company’s CEO, Jie Qiu, also told the Reporter that a Hollywood screenwriter would be on hand to ensure that NYSM canon was properly respected, and to help the studio preserve whatever the hell it is, exactly, that made Chinese audiences so enthusiastic for a fun-but-forgettable Jesse Eisenberg vehicle in the first place. Now You Seem Me 2 grossed $43 million at the Chinese box office, nearly twice what it earned in the U.S. It joins a number of films more readily accepted in China than in America in recent years, including the Nicolas Cage nonsense vehicle Drive Angry, and Sylvester Stallone and Arnold Schwarzenegger’s prison break movie Escape Plan, which Leomus is also eyeing for a potential Chinese sequel.